Starting with Chrome version 66, any Symantec SSL/ TLS issued before June 1st 2016 will stop functioning. The stable release of Chrome 66 was put into place April 17th 2018. Following later in the year. Chrome 70 all remaining Symantec SSL/TLS certificates will stop working. The first beta are scheduled for September 13th 2018 with the stable release launching around October 16th 2018. The Google announcement continued to say that as early as July 20, 2018 some chrome users might be blocked from sites using any Symantec SSL / TLS. Here at Essential Marketer, we use chrome on most of our computer and many of these have updated to Chrome 70 (Dev Version) – We were interested to see which major sites would be blocked due to having a Symantec SSL / TLS . Unless Paypal update their certificate before the stable launch of Chrome 70, any user using Google chrome will be unable to access the site. With 49% of internet users in the UK, using Google Chrome – this SSL issue could have a major impact for online transactions and e-commerce businesses. Here at Essential Marketer, all the site we host use Lets Encrypt Authority. We are advising our clients who have their own hosting arrangement to check their SSL / TLS certificate and update where needed. 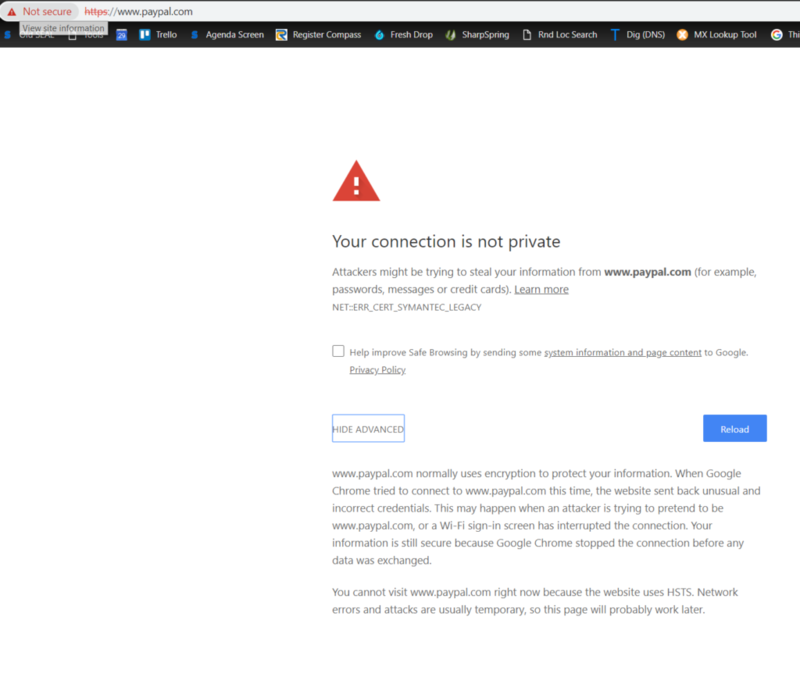 Since writing this post, Paypal has updated their SSL certificate.